With summer just a few months away, many employers are gearing up for summer internship programs—-or perhaps employers have already begun a spring internship program. 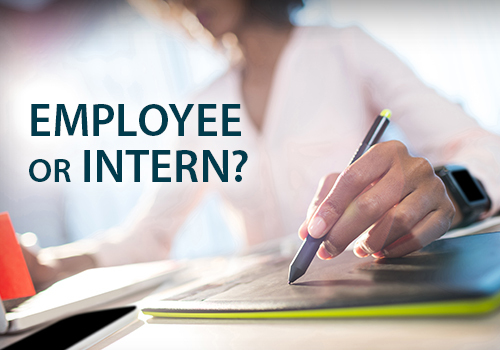 One question that may arise in an employer’s mind when hiring interns is whether these individuals may be classified as unpaid interns, or whether they should be classified as “employees,” subject to the protections of the Fair Labor Standards Act, including compensation for their work. The extent to which the intern and the employer clearly understand that there is no expectation of compensation. Any promise of compensation, express or implied, suggests that the intern is an employee—-and vice versa. The DOL also states in its guidance that this revised test is “flexible” and that “no single factor is determinative.” Rather, whether an intern or student worker should be treated as an employee under the FLSA will depend on the circumstances of each case. Thus, for an internship to be unpaid, it had to meet all six of these factors, including the broad requirement that an employer gain “no immediate advantage” from an intern’s services. Courts, however, have been reluctant to follow such the more rigid approach since it was adopted by the DOL in 2010. Several Circuit Courts of Appeal have favored the more flexible “primary beneficiary test.” For example, the Second Circuit in Glatt v. Fox Searchlight Pictures, Inc. and the Eleventh Circuit in Schumann v. Collier Anesthesia, P.A. follow the same seven-factor primary beneficiary test detailed above. Most recently, in December 2017, the Ninth Circuit in Benjamin v. B & H Education rejected the DOL’s old test and applied the Second Circuit’s primary beneficiary test to reach its conclusion that a group of cosmetology students were not employees of their school. In holding that the primary beneficiary test applies to determine whether an intern is covered by the FLSA, these courts have held that the DOL’s previous six-factor test was too rigid and did not account for unique considerations that may arise in certain situations. The DOL’s adoption of the primary beneficiary test for interns will most likely not have significant legal repercussions, as the DOL made the change to bring its test in line with the test courts have already been using. In practice, however, the DOL’s abandonment of the six-factor test may ultimately benefit employers. Nevertheless, employers should still periodically review their internship programs to determine if these programs are covered by the FLSA.